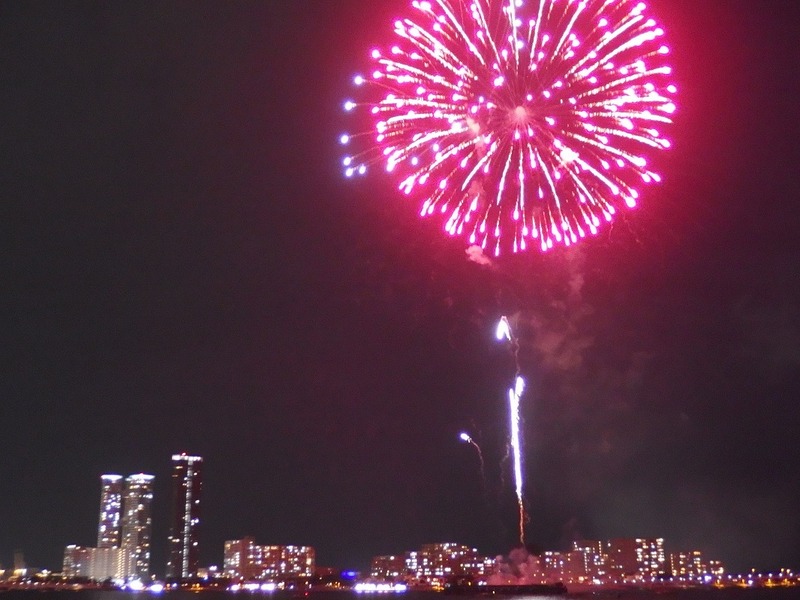 This time, I’m going to introduce “Fukuoka Higashi-ku Fireworks Display 2016”. 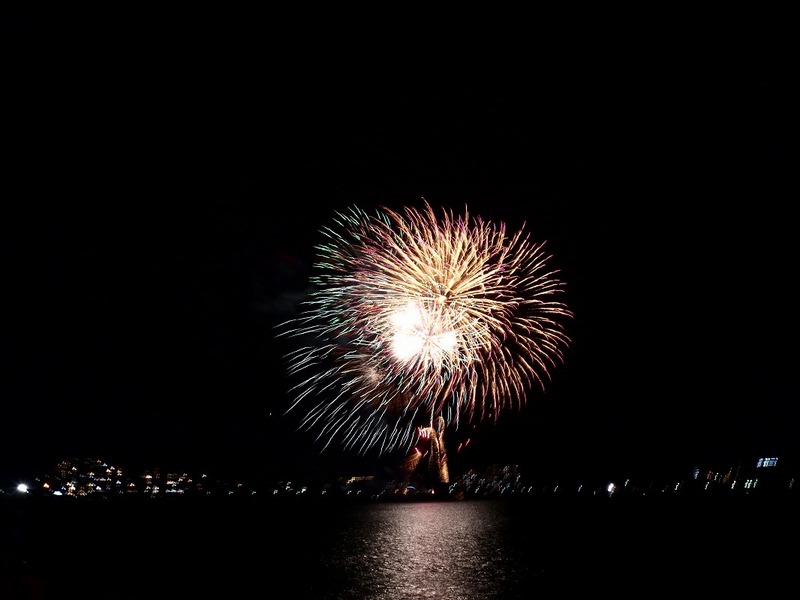 This fireworks display was scheduled in September, but it was postponed because of rough weather and was performed on October 15. 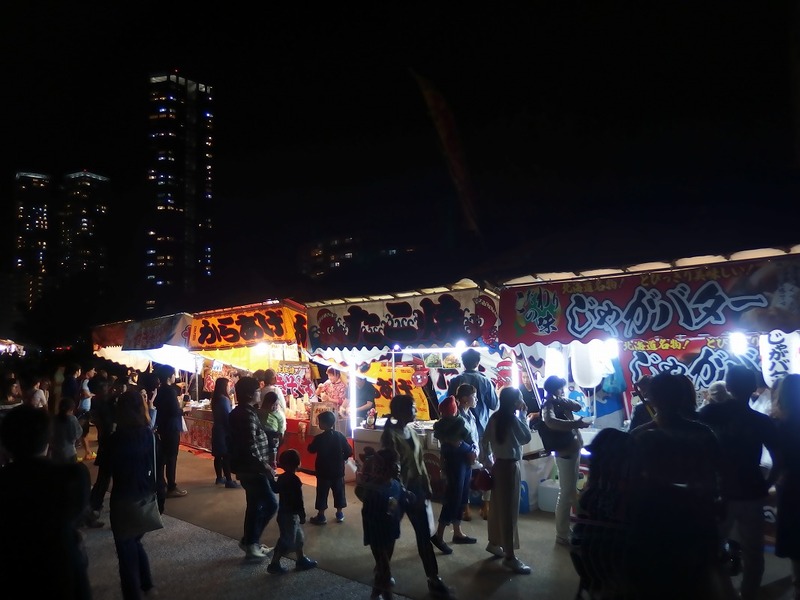 This is the citizen-centered fireworks display that is unusual held by the support of a donation from the public and *the local companies or the sales of the event goods. Even though it sounds like very locally, the scale is large. 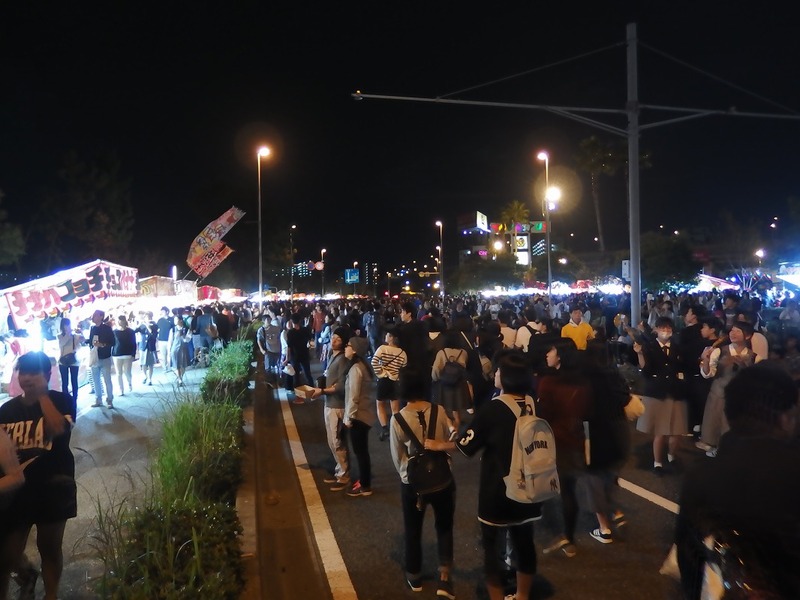 There are a lot of stalls line up on the road and over 100,000 people visit here to enjoy this festival every year. 7700 fireworks was launched in this year of 2016. And yes, I went to the festival and walked around to show you what is going on there! 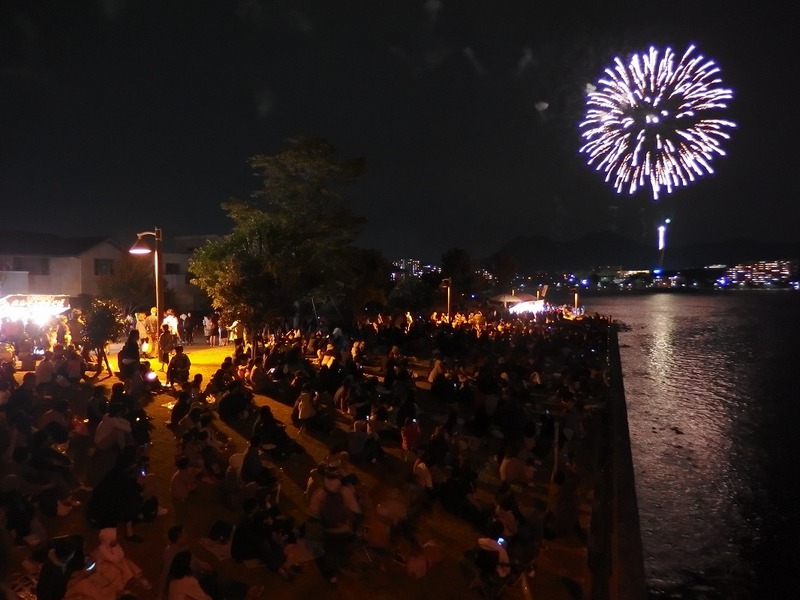 *Because local companies decrease in comparison with old days, it is said that it becomes difficult to continue this fireworks display. 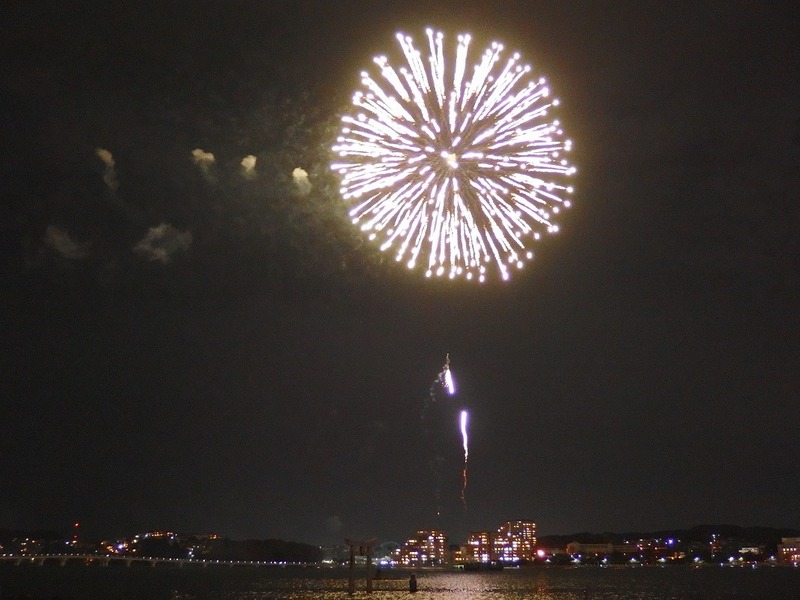 Time: Fireworks starts at 7:30 pm – 8:30 pm. The number of launch: 7700. Location: Higashi-ku, Fukuoka, Kashiihama-Kataosa coast (福岡県東区香椎浜片男佐海岸). Actually, this Kashiihama-Kataosa coast is a place I often come for jogging, so I visited here on foot this time. 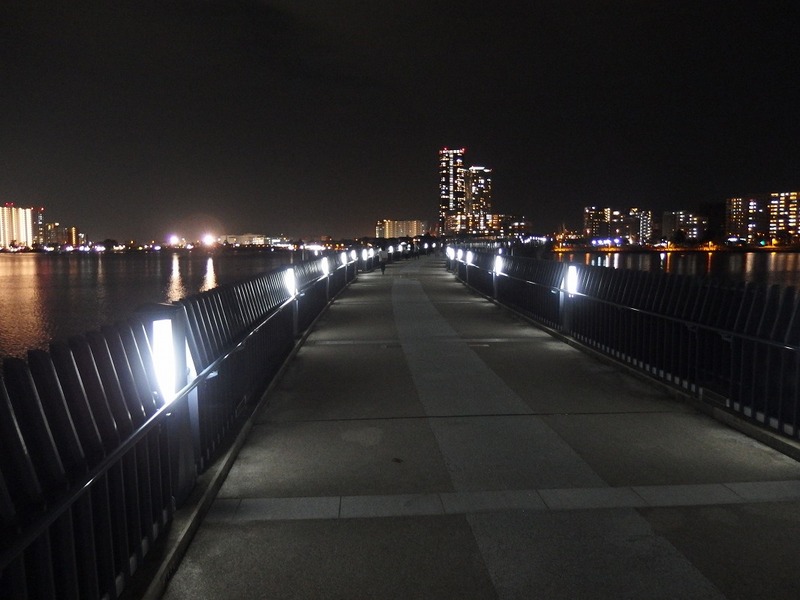 This is “Aitaka bridge”, pedestrian and bicycle-only. 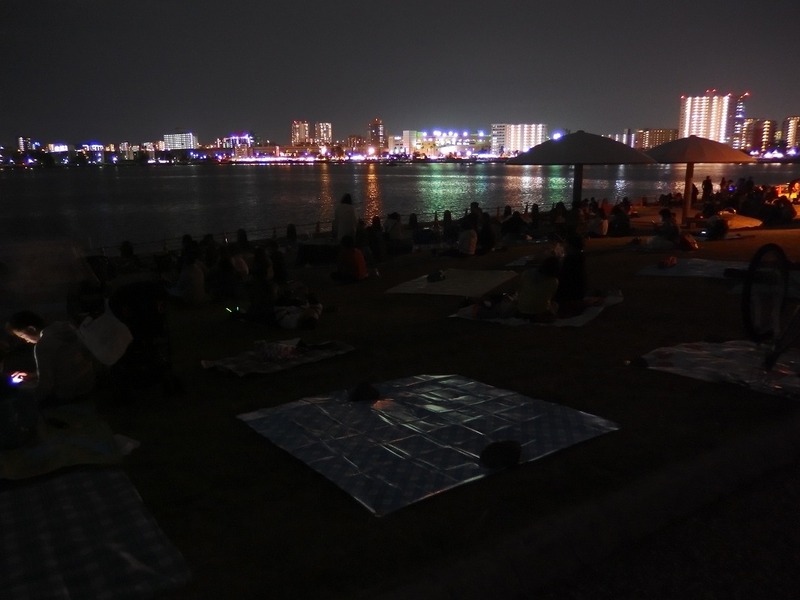 I thought that the view should be good from here, but unfortunately, it closes for the time of fireworks. The west side of the bay. 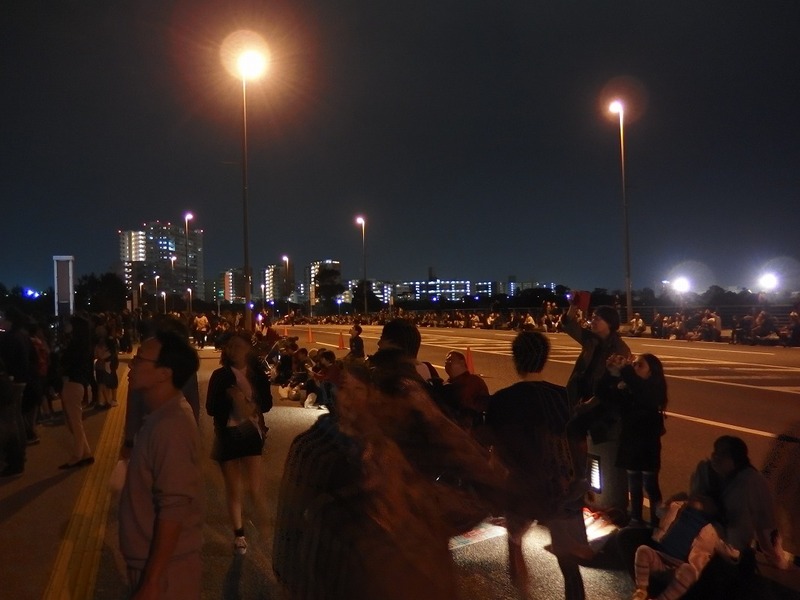 The time was just before the fireworks start, but was not crowded than I thought. 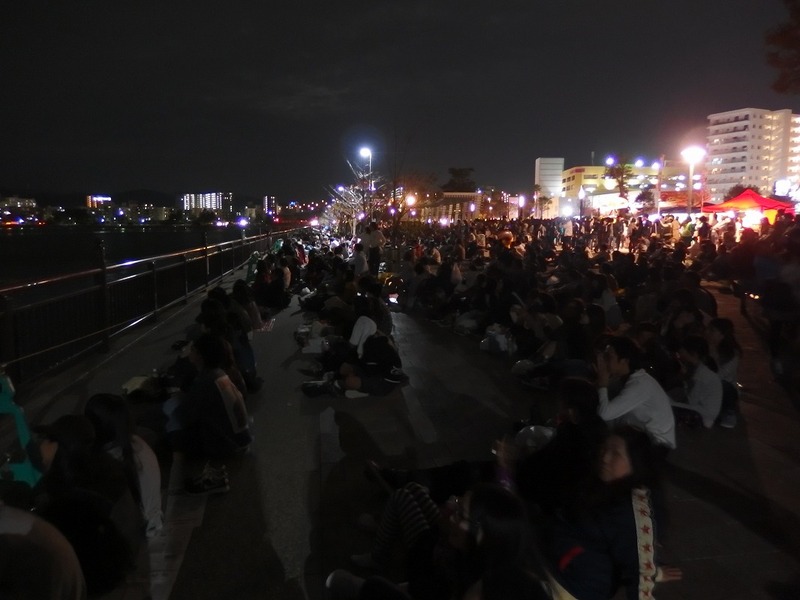 People spread a seat in the same way as time of the cherry blossom viewing and ensure a place early. You can keep a place from 12 o’clock on the day of the fireworks. It is near the “Mishima-Katarai Bridge” in the south-west. There were some stalls. It’s time for fireworks! It will continue for an hour from now on. The south side of the bay. It is on the Mishima-Katarai bridge in the south. It was still not crowded around here. 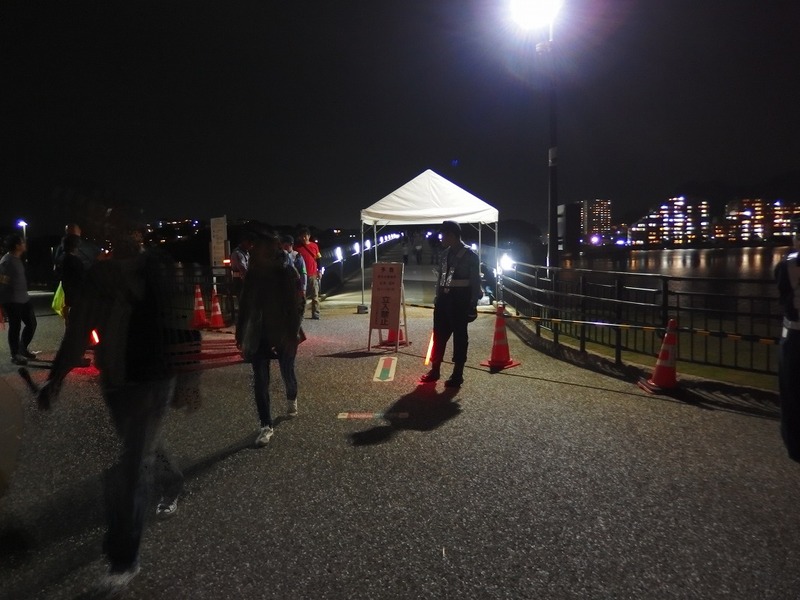 And this street (from Kataosa intersection to around Mishima-Katarai Bridge) will be pedestrian-only from 6 pm to 10 pm. Kashiihama North Park (香椎浜北公園) in the south. 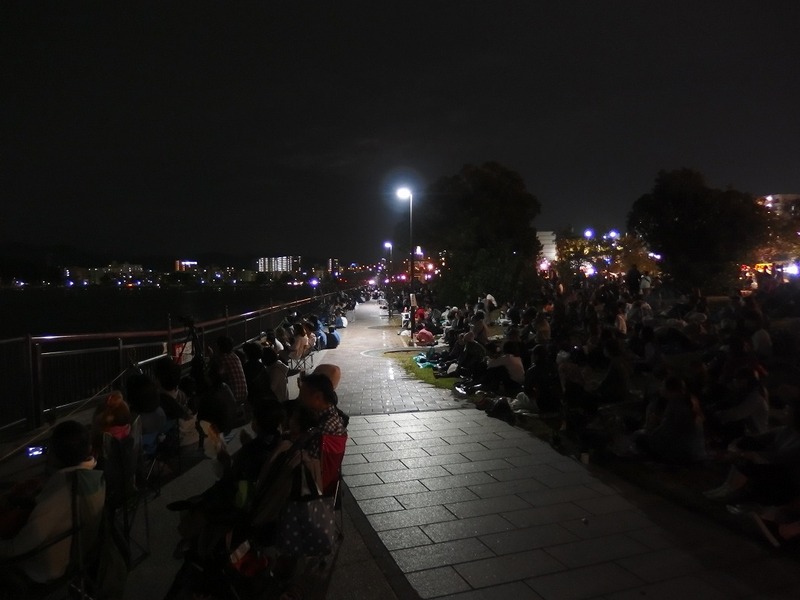 People were sitting and watching fireworks. As you can see a lot of people in the photo below, it will be very busy from around here. There were too many people sat down and I was not able to go forward any more. But for sure, it was a great view point here (Kashiihama North Park, in the south view point from the bay). I could not go forward, so I went back to the street, then found there were a lot of stalls and more people. It was crowded so as to go if I go to the east side, but is a level to be able to walk. You can see how much crowded at there, just in case. The east side of the bay. 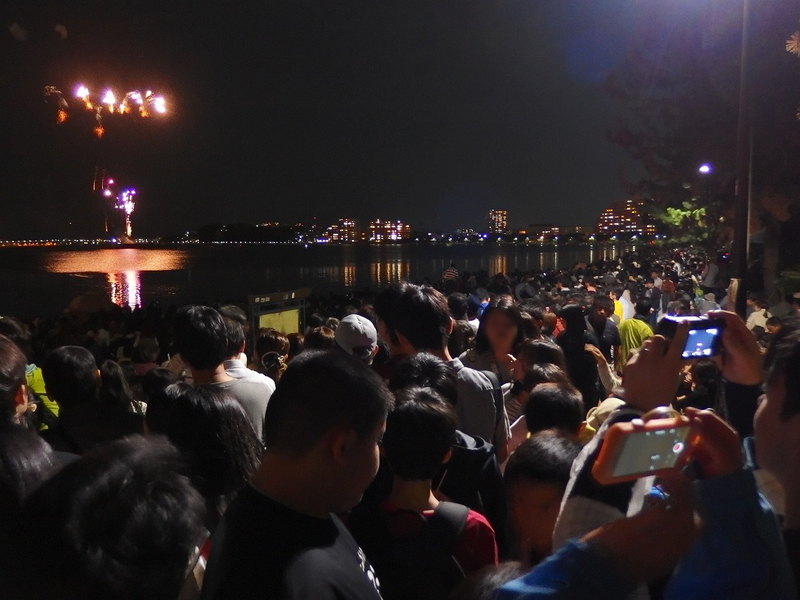 This is the coast of the east side with the fireworks display headquarters, and it was the most crowded place. I intended to enter the beach, but I couldn’t make it even one step. However, you can walk on the street along the beach that is pedestrian-only, and walk to the north a little, then you will be able to get in to the beach. A photo taken from east side. You can see fireworks quite close from here. The main view point that was introduced this time is around the orange circle. 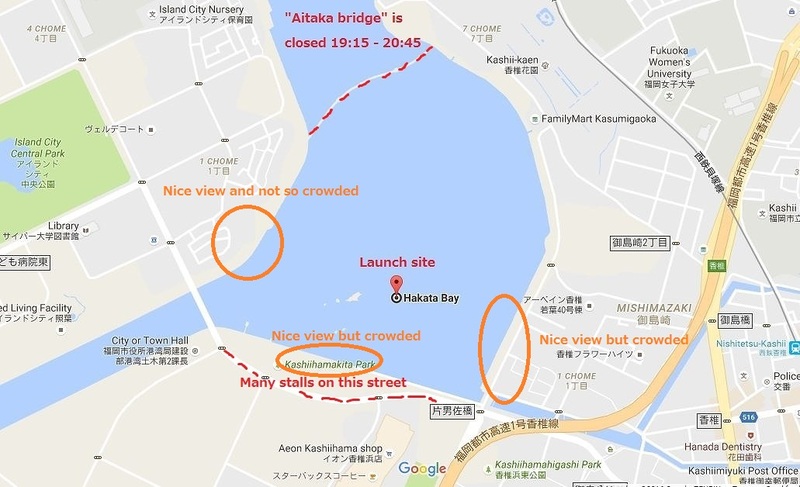 But, since the launch location of fireworks is in the middle of the bay, you will also be able to see the fireworks in other places. I filmed a video of fireworks this time, as well. It changes the viewpoint around 1:00, and 2:26 (the last). From JR Hakata Station: Use Kagoshima Main Line (JR鹿児島本線) and get off at JR Kashii Station (JR香椎駅). Then walk 21 min (1.7 km). From Nishitetsu Fukuoka Station: Use Subway Hakozaki Line (地下鉄箱崎線) to Kaizuka Station (貝塚駅). Change to Nishitetsu Kaizuka Line (西鉄貝塚線) and get off at Nishitetsu Kashii Station (西鉄香椎駅). Then walk 20 min (1.6 km). ← A flower world is shown up on the Sandbar. Flower Festival At Uminonakamichi Seaside Park.